Ash Wednesday, 2010 will begin the second full cycle for Treasury of Daily Prayer. For some users, February 17th will begin the second time through. Others may just be breaking in their new Treasury, while others may have had Treasury for awhile but not used it consistently and are now looking to begin daily devotions with the Treasury. 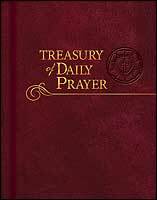 At a time of beginnings, it seems good to talk about the resource that is Treasury of Daily Prayer, and along the way suggest some strategies and encouragement of it use. What is Treasury of Daily Prayer? Treasury of Daily Prayer is designed to meet the needs of the Christian who wishes to follow a disciplined order of daily prayer centered in the Scriptures, and using the rich resources of liturgy, hymnody, prayer, and writings from the Church fathers and the Confessions, and to have this devotion work in a busy schedule. Treasury is designed to be an all-in-one resource for daily devotions for individuals, families, and small groups. It features the Daily Lectionary developed for Lutheran Service Book. Throughout the length and breadth of the Lutheran tradition, Scripture, psalmody, and hymnody have provided a core diet for Christ’s holy people—all within a Church Year calendar that observes the life and teachings of Christ, as well as remembers and gives thanks for the lives of faithful Christians gone before us in the midst of that “great cloud of witnesses” (Hebrews 12:1; Ap XXI 4–7). In this way, an observance of daily prayer finds itself integrally connected with the prayer life of the church catholic—both in time and throughout the world today. Treasury of Daily Prayer is firmly rooted within this astonishingly rich tradition. The beating heart of Treasury is the Daily Lectionary. While based on ancient lectionary patterns that preceded it, this Daily Lectionary is unlike most daily lectionaries in that it begins where the development of the Church Year began historically—with the Lent—Easter cycle centered in the celebration of Easter, the “Queen of Feasts.” Psalms, hymns, prayers, and a selected writing from the church fathers or the Lutheran Confessions all find their orbit around the appointed Scripture for the day. Seasonal Invitatories, Antiphons, and Responsories for use with the orders of Matins and Vespers (beginning on p. O—61) provide you with opportunity to celebrate and commemorate many of the feasts and seasons of the Church Year through the use of these seasonal texts. While these seasonal texts are presented here with Matins and Vespers in mind, several of the texts, like the seasonal antiphons, can certainly be used in other settings of daily prayer and devotion. The propers for each day are noted and arranged according to the Daily Lectionary. 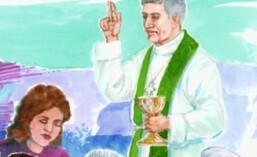 Propers are those texts within an order of worship or service that change with the seasons and days of the Church Year. In most instances the texts chosen for the propers support one of the readings from Scripture. The complete text of the propers are conveniently found together, arranged by day or date, in on place in Treasury. For many users, Treasury offers more resources than they have time for in the normal course of a day. The breadth of the resources, in part, account for the size of the book. It should never be assumed that unless you use everything in Treasury your devotions are deficient. This view of daily prayer will place an unnecessary burden on anyone who sees daily prayer as something that must be done, and will leave the offender—and that is what you will eventually come under this view—feeling guilty when life intrudes and an Hour or even a day is missed. The Scriptural understanding of the Church is that it is Christ’s body, in that perspective, the Church exists prior to individuals joining it. Individuals become Christians precisely through their incorporation into this community through baptism. The Daily Office is not an individualistic endeavor. Instead it is the way an individual participates in the prayer of the community, the Church. Thus, one does not need to feel burdened to participate in a particular office every day, or feel guilty when a time is missed. Rather, when you miss a time you typically set aside for prayer, be conscious that the prayer goes on as the people of God throughout the world call on their dear Father — you do not catch up with it, rather you join the ongoing prayer again when you can. If you decide to use the Treasury as a whole or in any part, it is helpful to put time limits on when a particular office is prayed. If, for example, your discipline is to pray Matins/Morning Prayer you might decide that you do not pray Matins after 10 a.m. If you miss the time window, you pick up the discipline again in the evening with Vespers, or before bed with Compline. In these matters there are no laws; rather there is the freedom in the Gospel to use or not to use the offices according to one’s needs and personal piety. Elsewhere on the Web (talked about here for example), and within the posts of this blog (here and here) are various discussions and strategies for using Treasury of Daily Prayer. For those who might be intimidated by Treasury, or for those who are looking for ways to work through Treasury for a second time, I offer some suggestions for your consideration. Order of Prayer. If you are new to Treasury or to using a devotional structure or order, you might want to simply turn to the day or date reading and praying through the propers. A next step would be to use one of the shorter orders found in Daily Prayer for Individuals and Families on pages O—42 – O—46. If you are praying in the morning, and time allows, add Close of the Day (O—46) or Compline (O—17) to your schedule. If you are looking at Matins, Vespers, Compline, Morning Prayer, or Evening Prayer and feeling intimidated by the music, or are hesitant to use these orders in family devotions because you don’t feel confident leading the singing, check out the music accompaniment to the orders of daily prayer called Evening & Morning from Concordia Publishing House. Played on a CD for family devotions or ripped onto your MP3 player for individual use, the beautifully sung ordinaries (those parts of the service that don’t change) will assist you in using these orders. Psalmody and Psalm. If you’re new to Treasury, use the psalmody as part of your devotion. If last year you used the Psalmody, this year use the “Additional Psalm” instead. The Psalter begins on page 1323. If you have opportunity to be in structured prayer twice or more a day, use the psalmody in the evening, and read the Psalms at morning prayer using one of the schedule in Treasury (pages 1436 and 1436. Readings. Choose to read either the Old Testament or the New Testament reading for the year. If last year you read both OT and NT readings, this year choose to read the Old Testament reading. If you read only the OT reading last year, than read the New Testament reading this year. If your schedule permits, supplement the reading of the Old Testament by reading out of The Lutheran Study Bible and exploring the notes associated with the appointed reading. Writings. Each day’s Writing is comment on the Old Testament reading, the New Testament reading, or on the context of the Church Year. If you have divided your readings by year, a quick look ahead will let you know if the writing fits with the reading. While the writings included in Treasury are rich and certainly worth reading for several years, you may wish to supplement the appointed writing with other orthodox devotionals. That’s fine, go ahead, my feelings won’t be hurt. Several good selections are available from CPH, including God Grant It: Daily Devotions from the sermons of C.F.W. Walther, To Live with Christ: Daily Devotions by Bo Giertz (on sale now for only $8), and Meditations on the Gospels. Hymnody. Using Lutheran Service Book the whole hymn could be used on any given day. Prayer. Add additional prayers to your devotion. The appointed prayer of the day is a collect, that is, it collects the thoughts expressed in the various readings, or the time of the Church Year, and carefully presents them for your consideration and prayer. But these are not the only prayers in Treasury of Daily Prayer. The section, Prayers, Intercessions, and Thanksgivings (pages 1306—1318), offer meditative prayers for each day of the week as well as prayers for various times and need. Also included here is the Litany, a comprehensive prayer that remains the pattern of prayer for the Church. Suggested Book of Concord Reading. By design, the appointed writing will take you through a decent portion of the Book of Concord. If you haven’t read the Book of Concord in its entirety, working through Treasury a second time might be the time to do so. Using Concordia: The Lutheran Confessions, or even the Book of Concord Online, following the suggestion at the end of each day will take you through the whole of the Confessions over the course of a year. It takes a lot of determination to blog every day. Few bloggers can manage it. If you are going to check out these good people, drop them a note of encouragement in their comments so that they know someone is listening. This entry was posted in Treasury of Daily Prayer and tagged TDP, Treasury of Daily Prayer. Bookmark the permalink.